Citi Bike is adding 139 new stations starting in August 2015, which is the first expansion since the program launched in 2013. Expansion areas include Long Island City in Queens, Williamsburg in Brooklyn, and the first stations north of 59th Street in Manhattan. New stations are detailed on the official Citi Bike Map here. Spread the word! Citi Bike expansion starts in early August, bringing stations to Queens for the first time in Long Island City, as well as expanding further in Brooklyn in Bed-Stuy, Williamsburg and Greenpoint. But we’re not stopping there! We’ll also be expanding to the Upper East and West Sides north to 86th Street this year. This is the first time Citi Bike has added new stations since launch and comes on the heels of software and hardware improvements as well as the introduction of a new bike. 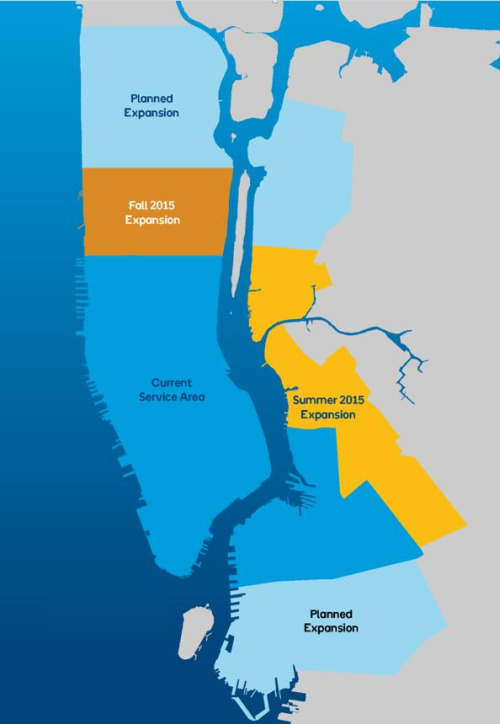 Expansion will continue, doubling the size of the Citi Bike program by the end of 2017.